When you install Office 2019, you are given the opportunity to create a free OneDrive account that offers up to 15GB of free cloud storage, with the capability to purchase additional storage. If you subscribe to Office 365, you get 1TB of cloud storage. 1. Choose File → Save As. 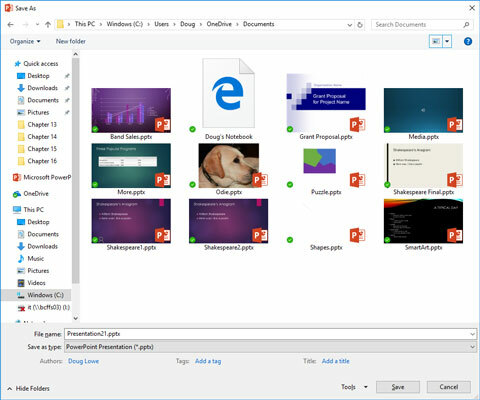 The Save As page appears, which offers several locations to which the presentation can be saved, as shown. The default location is your OneDrive account. 2. 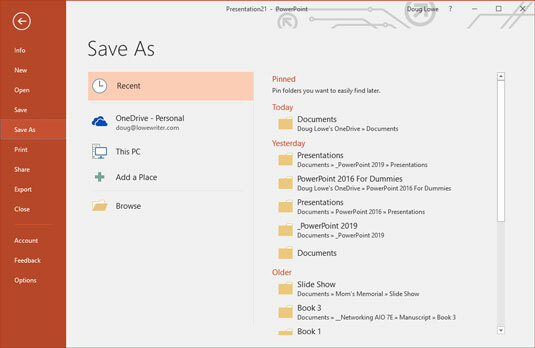 Click the OneDrive location where you want to store your presentation. The Save As dialog box appears, as shown. As you can see, this dialog box automatically navigates to your OneDrive account’s Documents folder. Browsing to your OneDrive Documents folder. 3. Navigate to another OneDrive folder or create a new OneDrive folder. You can navigate OneDrive as if it were a local hard drive. And you can create a new folder by clicking the New Folder button. The presentation is saved to your OneDrive.